I have sampled some of the baked goods at Tartine and have yet to be disappointed. This recipe is from the Cookbook via Tartelette. I followed the directions, except for some slight modifications. I made only enough dough for one pie crust. I blind-baked the crust for 20 minutes with beans as weights and then an additional 20 minutes without the weights. I initially used all of the ganache, but decided this looked like too much and scooped out about half of it (which was delicious to eat on its own later). I used approximately half of the caramel. The pastry cream came together well. 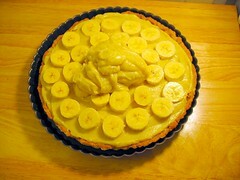 I added two thirds to the caramel, then the bananas and the last third of pastry cream. 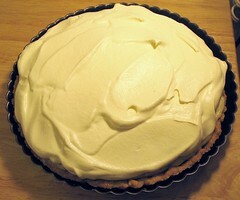 I chose to whip 1 c. of heavy whipping cream and spread it on top of the pastry cream. This wasn’t the prettiest pie and I didn’t bother with chocolate shavings, but it was extremely tasty. This was by far the favorite dish at the party. I want more right now, I wish some could instantly appear. I really need to get this book, even if it is not the best written cookbook.